Get Ready To Trick-or-*Tweet! Check Out These Twitter Hacks! It's Almost Time To Trick-Or-TWEET! Check Out These 10 Secret #Twitter Tips, Tricks and Hacks! It’s Almost Time To Trick-Or-TWEET! Check Out These 10 Secret #Twitter Tips, Tricks and Hacks! So you think you know everything about Twitter? I thought I did, too. Then I discovered this amazing, secret Twitter hack. Then another one! It was like being part of a club for years and then finding out that there’s a hidden, innerpart of the club that’s only for very special members. I wanted more. I was hooked. I had to find out more secret Twitter tips. More hidden tricks. More crafty hacks. And so I did. Check the list below for 10 secret Twitter tips, tricks and hacks that you probably don’t know. Scheduling tweets is a huge Twitter timesaver, as it allows you to plan out your day – or even your week or month – well in advance and not have to worry about always being onTwitter to take care of business. You might already be using apps such as Hootsuite, Buffer or TweetDeck to schedule your tweets, which are all great tools. But did you know you can also schedule tweets on Twitter.com? Yep: simply head on over to ads.twitter.com, login (or signup if you haven’t already done so), click on the ‘compose tweet’ button and then the ‘scheduling’ tab. Et voila! 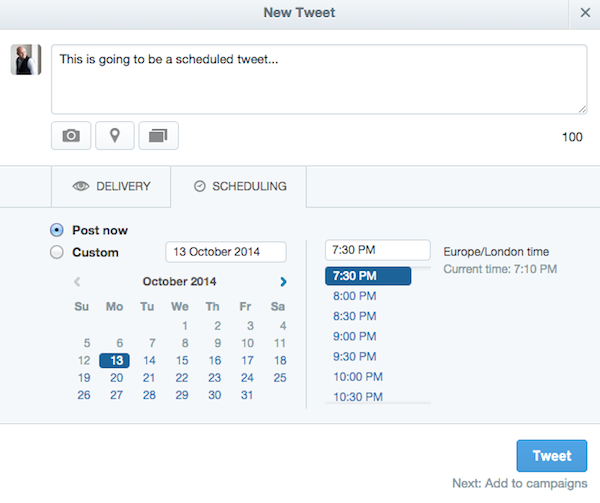 To view your scheduled tweets, click on ‘Creatives’ and then ‘Tweets’ and then the ‘Scheduled’ button. 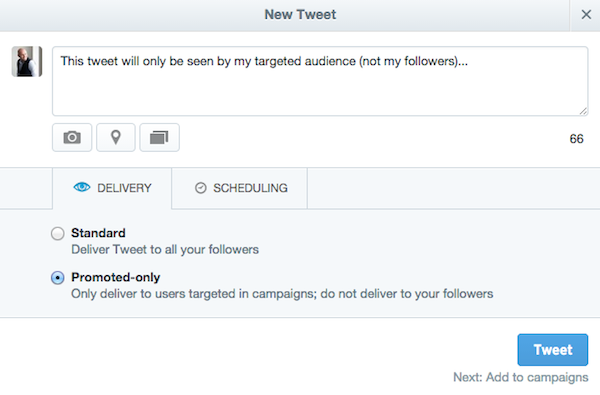 You can schedule both organic and promoted tweets up to one year in advance. Some people are die-hard keyboard users and occasionally you get the feeling that they would rather touch a real mouse than the computerised one on their desk. 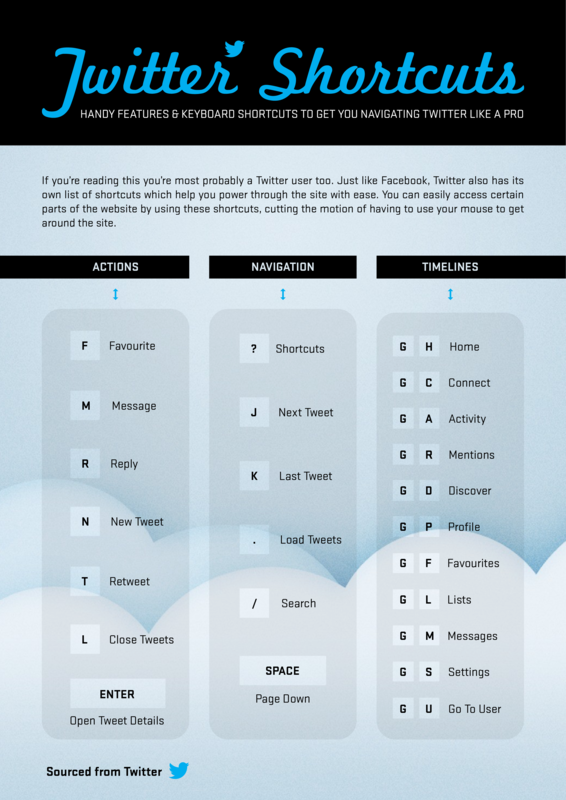 Twitter feels their pain and has a ton of keyboard shortcuts that can have you whizzing around your tweets in no time. For example, if you hit the ‘N’ on your keyboard whilst on Twitter.com, you’ll be able to immediately start writing a new tweet. Hit F to mark a tweet as a favourite, R to reply and T to retweet. Check the visual below for all the details, which comes courtesy of James Traf. 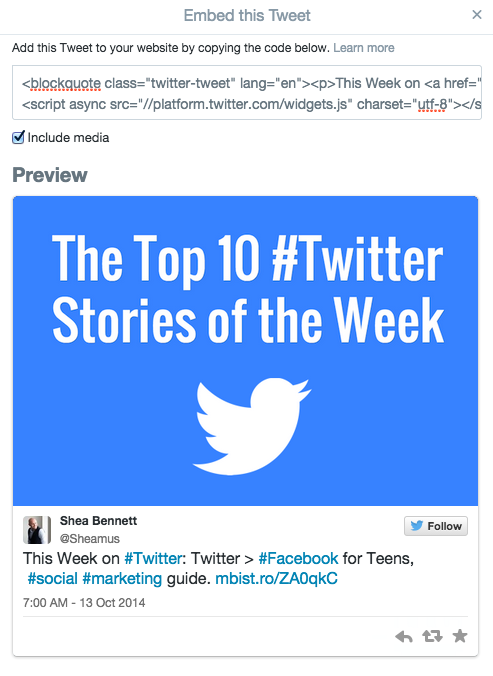 Embedding tweets into your website or blog is brilliant way to drive engagement back to your Twitter profile. Why? Because an embedded tweet is interactive, and anyone logged into Twitter can do all sorts of cool things (like reply, retweet, favourite etc) to your tweet when it’s embedded on your site (or any site). It’s also a far more elegant solution than doing a screen grab of a tweet and pasting that on your site, and even if somebody deletes the original tweet the embedded tweet will still be visible. To embed a tweet, find the tweet you want to embed, click on the more button (…) below the tweet (which is the ellipses symbol – the three dots in a row) and select ‘Embed Tweet’. Now just copy and paste the supplied HTML into the desired location on your website. Twitter Search is a super powerful but criminally underused part of the Twitter core. You’ve probably searched for one or two things in the past using the search box at the top of the screen on Twitter.com, but did you know that this also supports really advanced search operators? For example, if you want to search for just tweets with links, you can use the filter:links operator. Click on the link above and see what happens (it opens in another tab). This is a search for any tweets published on Twitter that contain the word amazing and also contain a link. This is good stuff! I wrote a whole article about Twitter search hacks – check here for all the details! This one’s a real time saver. When you setup a new account on Twitter it wants you to use an original email address – that is, an email that isn’t in use anywhere on the system. If you work in a business or agency that manages lots of Twitter profiles this can be a real pain. Thankfully, there’s a fairly elegant way around it. This tip requires you to have a Gmail account as your main email (or, at least access to a Gmail account). Most people don’t know that Gmail supports the use of the ‘+’ character to let you filter your main email. You don’t have to do anything on your Gmail account. All you do is add the ‘+’ and another word after the first part of your email address – the part before the @gmail.com – and you can use this as a “new”, standalone email address around the web. Here’s the sweet part: all emails sent to this “new” email will still go to your main Gmail inbox. For example, if your email address was johnsmith@gmail.com, if you use johnsmith+twitter@gmail.com on any website, any email sent to the latter would go to your inbox (johnsmith@gmail.com). Gmail knows that the part before the plus symbol is your username, but Gmail understands the part after the plus symbol, too. If you use Gmail you can try this yourself now – fsimply send an email to yourusername+whatever@gmail.com, where yourusername = your Gmail username. Now you can go ahead and use yourusername+twitter@gmail.com for a new Twitter profile, even if yourusername@gmail.com is already in use on Twitter. You could also set up Twitter profiles using yourusername+twitter2@gmail.com, yourusername+clientname@gmail.com, yourusername+facebook@gmail.com, and so on. Even better, you can configure Gmail as usual so that it filters and labels these “new” email addresses however you want. When you join Twitter all the emails you receive can be a real PITA, and it seems like a month doesn’t go by without Twitter adding yet another email notification to its roster. Thankfully, you can turn all of them off with a single click: simply log on to Twitter.com, visit your profile settings and click on the ‘Email notifications’ tab. From here click on the ‘Turn off’ button to disable all email. Nice! This is a mistake I see people who have been using Twitter for years and years make every single day. If you start a tweet with @username it’s a reply, and will ONLY be seen by the person you’re sending the tweet to and anyone else on Twitter who is following BOTH of you. Nobody else will see that tweet in their timeline as Twitter assumes it’s a reply and won’t deliver it (although it will be visible on your profile and in Twitter search results to everybody). If you put someone’s @username ANYWHERE ELSE in the tweet but right at the very beginning, it’s a mention and will be seen by everyone who follows you. You’re welcome! Twitter’s Promoted Tweet advertising tool is a powerful way to reach a targeted audience and drive engagement, awareness and clicks. But did you know that you can select to show a Promoted Tweet only to your target audience, and not your existing followers? To do this, simply select the ‘Promoted-only’ option when you’re constructing your Promoted Tweet. Why would you want to do this? Showing very specific content to a select group of people is a very effective way to drive new business, especially if it’s a promotion that may not be as valuable to your existing fans, or might be something they’ve already seen. Or, it might be something you only want to give to new customers – for example, 25 percent off of their first order. With a promoted-only Promoted Tweet, you can do that! 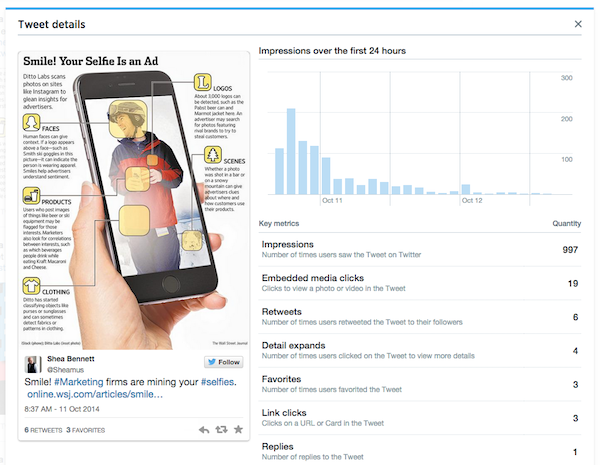 Did you know that Twitter gives free analytics tools to everybody? Yessir, they do, and you can get all the goodness by simply visiting analytics.twitter.com and logging in with your account. From here you want to choose the ‘Tweets’ option which lets you look at detailed analytics for the last 28 days of your tweets, including overall impressions, engagement rate, link clicks, retweets, favorites and replies. But here’s the best stuff – click on any tweet to load a pop-up of all the key metrics for that tweet, including impressions, clicks, favorites, follows, retweets and more. Twitter came relatively late to this party – Facebook has supported pinned messages on its Pages for quite some time now – but anyone can pin any tweet to the top of their profile, where it will sit permanently until it’s unpinned or replaced by another pinned tweet. To do this, find the tweet you can to pin, click on the more button below the tweet (which is the ellipses symbol – the three dots in a row) and select ‘Pin to your profile page’. Click the ‘Pin’ button on the pop-up and that tweet is now permanently fixed to the top of your profile. To unpin a tweet, click on the more button again and choose ‘Unpin from profile page’. I hope you’ve enjoyed these 10 secret Twitter tips, tricks and hacks – I’ll bet there was at least one that you didn’t know! Do you have any Twitter secret hacks of your own? Hit the comments to let us know!